Rory McIlroy parted ways with JP Fitzgerald after the British Open, ending a nine-year partnership that the Northern Irishman felt was heading in a bad direction. Rory McIlroy (right) of Northern Ireland and his caddy, JP Fitzgerald, look down the fairway before McIlroy tees off from the first hole during the final round of The Barclays in Farmingdale, New York, in this August 28, 2016, photo. McIlroy has parted ways with Fitzgerald and will use his best friend, Harry Diamond, as his caddie at the Bridgestone Invitational and the PGA Championship next week. 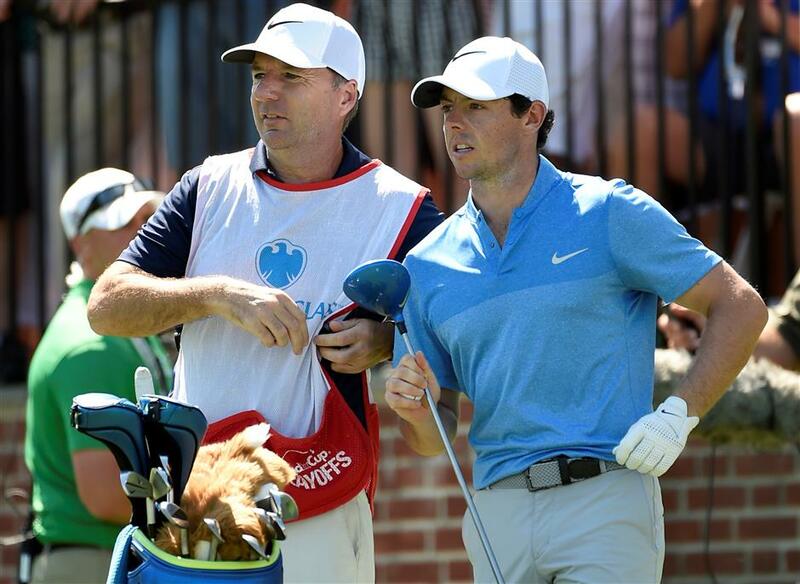 Rory McIlroy says he got rid of a caddie so that he could keep a friend. The Northern Irishman parted ways with JP Fitzgerald after the British Open, ending a nine-year partnership that McIlroy felt was heading in a bad direction. "I still consider JP one of my best friends, one of my closest friends," McIlroy said on Wednesday. "But sometimes to preserve a personal relationship, you might have to sacrifice a professional one, and that was sort of the decision that I came to in the end." McIlroy will use Harry Diamond, the best man at his wedding, at the Bridgestone Invitational and next week at the PGA Championship, the final major of the year and the last chance for McIlroy to avoid three straight years without one. "I was getting very hard on him on the golf course, and I didn't want to treat ... anyone like that," McIlroy said. "But sometimes this game drives you to that. But I felt like it was the right thing to do, and I don't think there was any good time to do it." He figured the Bridgestone Invitational, a short field with no cut, would give him four rounds to get used to a different caddie. Diamond gives him a close friend, and someone who played for the Irish team as an amateur. What surprised McIlroy was the attention it brought, particularly because player-caddie relationships are tenuous. It came one month after Phil Mickelson and Jim "Bones" Mackay ended 25 years together as player and caddie. That was remarkable in how long it lasted. Tiger Woods used Mike "Fluff" Cowan when he turned pro in August 1996, and that lasted about 30 months. He used his high school friend, Bryon Bell, and won the Buick Invitational at Torrey Pines and reached the quarterfinals at the Match Play Championship before hiring Steve Williams. That lasted 12 years. McIlroy praised Fitzgerald after the opening round of the British Open, where McIlroy was 5 over through six holes. He said Fitzgerald told him on the sixth tee, "You're (expletive) Rory McIlroy," which he said helped him get back in the game. By the end of the week, McIlroy was ready to move on. He said he intended to tell Fitzgerald after the final round except that his caddie had to catch a boat across the Irish Sea to Dublin. The next day, McIlroy had a Nike outing in London. He finally called him on Tuesday. "I thanked JP for everything," he said. "JP knows how much I think of him, how much he means to me, what we've achieved together, and it wasn't an easy decision. But at the end of the day I felt like it was a change that I needed to make because I got to the point where if I didn't play a good shot or if I made a wrong decision, I was getting more frustrated at him than I was at myself. "I would much rather be angry at myself, and angry at myself for making a wrong decision, than being angry at him." McIlroy said the change would force him to take more ownership of his game, starting with getting his own yardages and deciding what shots to hit. He said it was unclear if Diamond would work more than the next two weeks. McIlroy has a week off between the PGA Championship and the start of the FedEx Cup playoffs, which might be enough time to find a permanent replacement or try out a tour caddie. He also didn't rule out Diamond working longer. "If we have a couple of good weeks here, you never know," McIlroy said. "He knows me, and that was the big thing about the next two weeks. I just needed someone who knew me and knew my thought process." Fitzgerald previously worked for Ernie Els. When they split up in 2008, McIlroy wasn't happy with his caddie and was on a run of missing cuts. He hired Fitzgerald in the summer, and they ended the year with McIlroy having four top-5 finishes. McIlroy won 21 times, including four majors, with Fitzgerald on the bag. The most recent victory was last year at the Tour Championship, which gave McIlroy the FedEx Cup title and the US$10 million bonus. It was a big windfall for the caddie, too. McIlroy wrote him a check for US$1,050,000 — 10 percent of the bonus (McIlroy received US$9 million up front) and the US$1.53 million check from winning the tournament.